The Great Sioux Nation covers the entire state of South Dakota and parts of surrounding states. Great Plains Indians were deemed “Sioux” by French trappers who abbreviated a Chippewa term. The Chippewa were not allies of the Plains people, and the term “Sioux” translates to enemy or little snakes. To properly acknowledge and understand today’s “Sioux” people, you must first understand the true definition of their culture. Oceti Sakowin - Seven Council Fires - properly refers to the entire Great Plains tribal system. Within the Oceti Sakowin, there are three tribal divisions, and each division is comprised of bands, who all speak different and distinct dialects. Originally, called Isanti - or Knife Makers - they were also known as the Santee. The eastern division consists of four bands. Members of this division spoke the distinct Dakota dialect. The smallest division, these Native Americans moved into eastern South Dakota and northwestern Minnesota. The division consists of two bands. 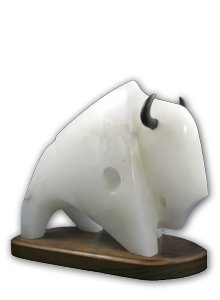 In addition to speaking the Nakota dialect, they are known as the Keepers of the Sacred Pipestone. Made up of seven bands, the western division is the largest division. All members of these bands speak the Lakota dialect. Tetonwans - Dwellers on the Plains - traditionally occupied the area west of the Missouri River; later, they spread out and settled the sacred lands of the Paha Sapa - Black Hills. Each of the three divisions has always been distinguishable because of their individual dialects, lifestyles and means of sustaining themselves. Additionally, all members of the Oceti Sakowin hunted from northern Canada south to the Republican River in Kansas and from the Mississippi River to the Bighorn Mountains in the west. Living in separate bands made up of extended families or tiyospayes, the Seven Council Fires came together at least once a year, usually midsummer during the season of the Sundance ceremony. During this time, vows were made and fulfilled. This was also a time for celebrating each other’s victories, socializing, horseracing and contests. While the adults discussed and planned issues of national interest, the youth courted and enjoyed each other’s company. Everyone traded goods at this annual event. Cultural change began in 1803 when the United States completed the Louisiana Purchase from France. The land purchased was home to thousands of Native Americans; however, the act did not give the government the right of possession of the land. The Supreme Court declared that the government had to honor Indian land holdings by entering into nation-to-nation treaties which were the first law of the land, according to Article Six of the Constitution and purchasing land from the Indian people for white settlement. Numerous violations of these land rights by the government and white settlers caused much dissent. White hunters - encouraged by government bounty killed millions of buffalo, the Sioux people’s primary source for food, clothing and shelter. After this sacred animal was destroyed, the Great Plains Indians had no choice but to negotiate. The treaty of 1868 was established between the Sioux Nation and the US Government to maintain peace and to establish reservations where Indian people would live, protected by the US Constitution. In exchange for the land given to the US for white settlement, the government agreed to protect the Sioux people’s right to hunt and to provide them with health care, education and personal livelihood. After thousands of years of roaming their vast buffalo hunting land, the Lakota people were required to settle on eleven reservations - nine of which are in South Dakota that today make up the Great Sioux Nation.